The Battle of White Marsh was a battle of the Philadelphia campaign of the American Revolutionary War fought December 5–8, 1777, in the area surrounding White Marsh, Pennsylvania. The battle, which took the form of a series of skirmish actions, was the last major engagement of 1777 between British and American forces. 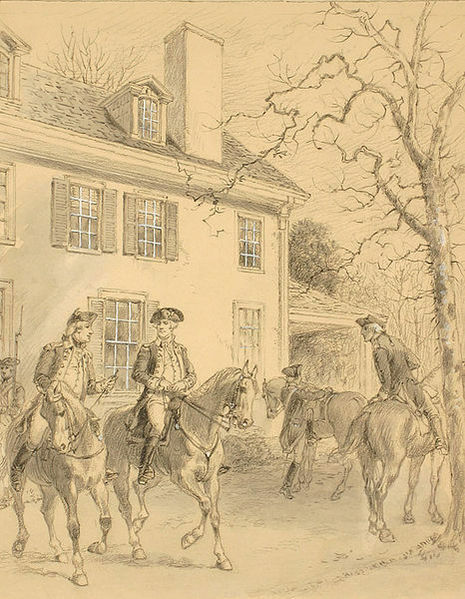 Gen. George Washington, commander-in-chief of the American revolutionary forces, spent the weeks after his defeat at the Battle of Germantown encamped with the Continental Army in various locations throughout Montgomery County, just north of British-occupied Philadelphia. In early November, the Americans established an entrenched position approximately 16 miles (26 km) north of Philadelphia along the Wissahickon Creek and Sandy Run, primarily situated on several hills between Old York Road and Bethlehem Pike. From here, Washington monitored British troop movements in Philadelphia and evaluated his options. On December 4, Gen. Sir William Howe, the commander-in-chief of British forces in North America, led a sizable contingent of troops out of Philadelphia in one last attempt to destroy Washington and the Continental Army before the onset of winter. 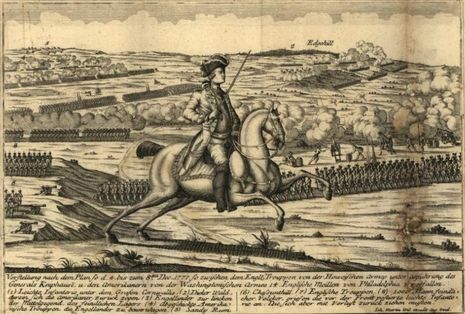 Washington repelled the British attacks in a series of skirmishes, and Howe returned to Philadelphia without engaging Washington in a decisive conflict. To THE PRESIDENT OF CONGRESS Head Qurs., White Marsh, December 10, 1777. Sir: I have the honor to inform you, that in the course of last Week from a variety of intelligence I had reason to expect that General Howe was preparing to give us a general Action. Accordingly on Thursday night he moved from the City with all his Force, except a very inconsiderable part left in his Lines and Redoubts, and appeared the next Morning on Chesnut Hill, in front of, and about three miles distant from our Right wing. As soon as their possition was discovered, the Pennsylvania Militia were ordered from our Right to skirmish with their Light, advanced parties, and I am sorry to mention, that Brigadr. Genl. Irvine, who led them on, had the misfortune to be wounded and to be made prisoner. Nothing more occurred on that day. On Friday night the Enemy changed their Ground and moved to our left within a mile of our line, where they remained quiet and advantageously posted the whole of the next day. On Sunday they inclined still further to our left, and from every appearance, there was reason to apprehend they were determined on an Action. In this movement their advanced and flanking parties were warmly attacked by Colo. Morgan and his Corps, and also by the Maryland Militia under Colo. Gist. Their loss I cannot ascertain, but I am informed it was considerable, having regard to the number of the Corps who engaged them. About Sun set, after various marches and countermarches they halted, and I still supposed from their disposition and preceding Manoeuvres, that they would attack us in the Night or early the next morning, but in this I was mistaken. On Monday afternoon, they began to move again and instead of advancing filed off from their Right, and the first certain account that I could obtain of their intentions was, that they were in full March towards Philadelphia by Two or Three Routes. I immediately detached light parties after them to fall upon their Rear, but they were not able to come up with them. The Enemy's loss, as I have observed, I cannot ascertain. One account from the City is, that Five hundred wounded had been sent in; Another is that Eighty two Waggons had gone in with Men in this situation. These I fear are both exaggerated and not to be depended upon. We lost Twenty Seven Men in Morgans Corps in killed and wounded, besides Major Morris, a Brave and gallant Officer, who is among the latter. Of the Maryland Militia, there were also Sixteen or Seventeen wounded. I have not received further Returns yet. I sincerely wish, that they had made an Attack; the Issue in all probability, from the disposition of our Troops and the strong situation of our Camp, would have been fortunate and happy. At the same time I must add that reason, prudence, and every principle of policy, forbad us quitting our post to attack them. Nothing but Success would have justified the measure, and this could not be expected from their position. The constant attention and watching I was obliged to give the Enemy's movements, would not allow me to write before, and this I believe was the less material, as I have reason to think your Committee, who were in Camp most of the time, and who are now here, transmitted an Account of such Occurrences, as they deemed important in any degree. The first cause too, Sir, and my Engagements with the Committee previous to the coming out of the Enemy, will, I trust, sufficiently apologize for my not acknowledging before, the honor of your favors of the 30th Ulto. and 1st Inst. which came to hand in due order and time. I am &ca.